Zee Cine Awards 2019 took place on March 19. Everything that was the best of the best in the movies from the previous year was awarded and celebrated. And when we say everything, we mean it. Because Ranbir Kapoor and Alia Bhatt's romance was the best link up news that we got in 2018 and it was celebrated on the main stage as well. Alia and Ranbir started dating each other somewhere around when they started working on their upcoming film, Brahmastra. The actors were on the main stage collecting their awards, it seems, because theirs doesn't look like a rehearsed performance. 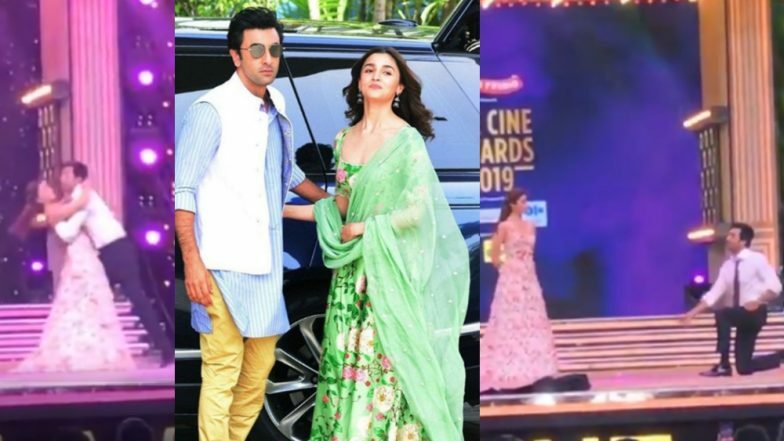 Deepika Padukone-Alia Bhatt Pose Together While Their Partners Ranveer Singh and Ranbir Kapoor Bond at Zee Cine Awards 2019 Event (View Pics). It also seems that somehow the hosts Vicky Kaushal and Kartik Aaryan coerced Alia and Vicky into giving a romantic performance. The choice of the song they danced to could not have been better. It was Alia's first ever romantic number - Ishq Wala Love from her debut film, Student of the Year. Zee Cine Awards 2019 Full Winners List: Vicky Kaushal, Katrina Kaif, Kartik Aaryan, Janhvi Kapoor Take Away the Trophies Home. Ranbir can be seen taking his coat off, rolling his sleeves up which is charismatic in its own way. He then pulls Alia close to himself and even gives her a twirl. The hearts of the fans are also twirling. Alia and Ranbir look cute dancing together. Stop everything and watch this! The two actors will be seen in Dharma Productions' Brahmastra. The movie has been directed by Ayan Mukerji and is the first part of an intended trilogy. The action film with fantastical elements also stars Amitabh Bachchan and Mouni Roy in key roles. The first logo of the movie was released at the Kumbh Mela 2019. The first teaser should drop on the internet soon. Brahmastra will release in December 2019.